Demonstrators marched through Al-Khalil today holding torches, flags and signs that called for the re-opening of the stolen Shuhada street, the return of TIPH and other international support, the end of the occupation, as well as a statements of anti-imperialism, anti-colonialism and solidarity with Venezuela. We stand in solidarity with the Dismantle The Ghetto Campaign. 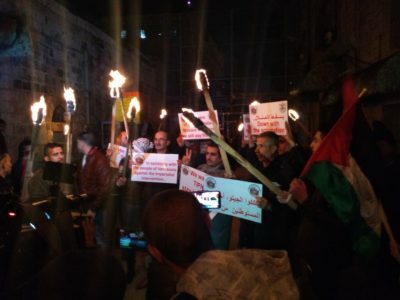 They issued this statement during their Torch March demonstration, on the 10th of February 2019, in Al-Khalil. The recent announcement of the Israeli government shutting down the Temporary International Presence in Hebron (TIPH) and the Ecumenical Accompaniment Programme in Palestine-Israel’s recent decision to withdraw their team from Hebron, coupled with seven Christian Peacemaker Team workers denied entry, has put the Palestinian community in Hebron in a vulnerable position. We need your solidarity more than ever. Since the beginning of the 1967 occupation, the Israeli settler movement has concentrated on the colonization of Hebron. 1994 was a turning point in their movement. On February 25, American-Israeli Baruch Goldstein of the Jewish extremist organization, Kach, opened fire on worshipers in the Ibrahimi Mosque killing 29 Palestinians and wounding another 125. Despite an Israeli settler committing the massacre, it was the Palestinians who were forced to pay the consequences, setting a clear message that those who commit violence against Palestinians will not face the consequences. A policy of indiscriminate restrictions on Palestinians emerged as a means to perpetuate indigenous displacement and the establishment of illegal Israeli colonies. The Israeli military imposed curfews on the Palestinian community in the early 2000s. Entire streets were shut off from Palestinian access. The Israeli army closed over 520 Palestinian in the center of Hebron, and nearly another 1000 Palestinians were forced to close their shops due to the economic impact of Israeli’s checkpoints, road closures, and settler violence. This campaign is about the memorial of the Ibrahimi Mosque Massacre of 1994, the thousands of lives lost, the millions of lives permanently impacted by Israel’s illegal military occupation. 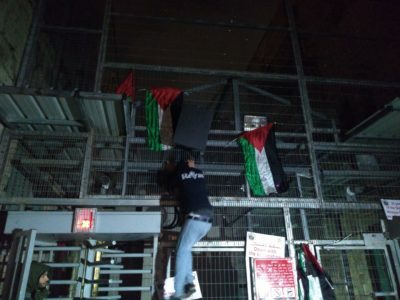 We are focusing on Hebron as a microcosm of the occupation, a symbol of the colonial settlement issue, the policy of separation in Hebron/al Khaleel and the entire West Bank, the lack of freedom of movement, and the occupation at large.